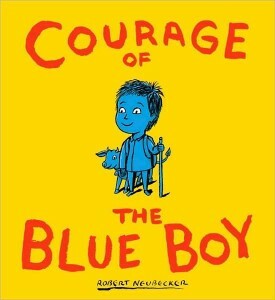 Children’s book Courage of the Blue Boy by Robert Neubecker is more than a story of courage. It tackles topics like diversity, individuality and true self-expression, and does so in such a colorful way! Blue is a boy who lives in a town where everything is the same color: blue. He and his friend, Polly, decide there must be something more. Together they venture out into the world in hopes of adding a little more color and variety into their lives. Along their journey Blue and Polly encounter disappointment, joy, fear, and ultimately a great place to be themselves. Eventually Blue discovers a town that completely embraces diversity and individuality. Yet, when he first realizes he is different than everyone in this magnificent, colorful town, Blue becomes frightened. Remembering how much safer he felt when he was the same as everyone else, Blue finds the courage to express his true color despite his fear. Blue’s willingness to express his unique qualities not only helps Blue. The entire town becomes better for it as well! This is a simple, delightful picture book perfect for discussions about courage and about expressing your true self. It is also just as enjoyable for the very young who are learning all about colors. For a growing collection if inspiring children’s books like this one, visit Children’s Book Finds.